It is not yet know if it will come to the uk or if it does come, when it will come. In America it is expected to arrive round spring, 2010. 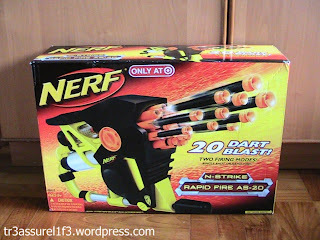 Nerf Rapid Fire AS-20- Review! The following review is not by me, it is from ILiekNerf a singaporean nerfer. All credit goes to him. 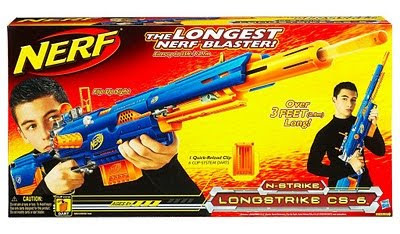 The N-Strike Rapid Fire AS-20 includes the AS-20 Blaster itself and 20Micro Darts. Its costs up to a total of S$85 when all of the costs(Original price + Shipping) are totalled. 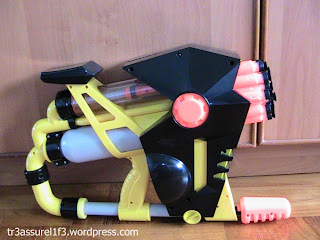 The AS-20 is a automatic blaster which is powered by its internal air tank, which is in turned primed by the priming stick attached to it. Pumping the priming stick 30-35 times will fill up the air tank. When the trigger is squeezed, the compressed air will be forced out to propel the darts. The AS-20 also features 2 Firing Modes : Rapid Fire(Full Blast) mode and Single Shot(Semi-Automatic) mode, allowing users to switch if situations in a war change. The AS-20 itself is alittle bulky, nontheless, its more versatile and the ROF is higher than a vulcan. Overall, the Rapid Fire AS-20 is an extremely good blaster for rushing up to your opponents or being in Close Quarter Combat games. Or maybe for raining your family in darts! 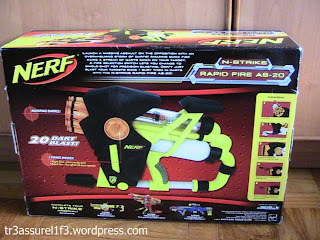 Welcome to Uknerf's first review, the Nerf strikefire dart tag set. The set includes two Nerf Strikefires, two tagger vests, two pairs of strange looking glasses and 12 tagger darts. It cost a £19.99 in all which is great value for what you get. The Strikefire is a single shot manual load pistol, i personally like the rapid fire guns but you need some back up when you need to pump your primary. The ranges of this gun stock are awesome about 25- 30 feet, i added another o-ring to each so mine get about 35 feet. Another good thing about this gun is how many darts it can hold, six in total (including the one that shoots). The gun is easy to move around with and fun to dual wield, a bit hard to reload though. Nerf Strikefire Dart Tag box - front. 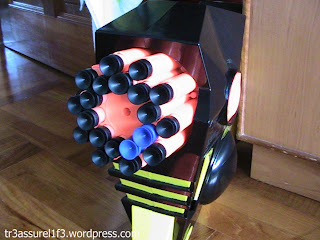 Nerf Strikefire Dart Tag Box - back. 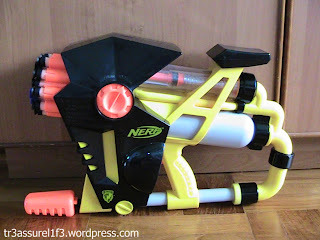 Nerf Strikefire - Front On View. Nerf Strikefire Dart Tag - complete set. Nerf Strikefire - Test Fire. welcome to UKnerf! be sure to follow and comment if you have any advise!